Dinner tonight was roasted chicken and this kale and potato gratin. The aroma coming from the oven was amazing. I really enjoyed this gratin. The soft potatoes and garlicky kale are so good together. I added some red onion because I had some to use up, and I think it made it that much better. Boil potatoes in salted water for about 2-3 minutes, until tender, but not cooked through. Drain into a colander and rinse with cool water. Set aside. In a large bowl, combine the olive oil, garlic, salt and pepper. Add the kale and rub the olive oil mixture aggressively into the leaves. 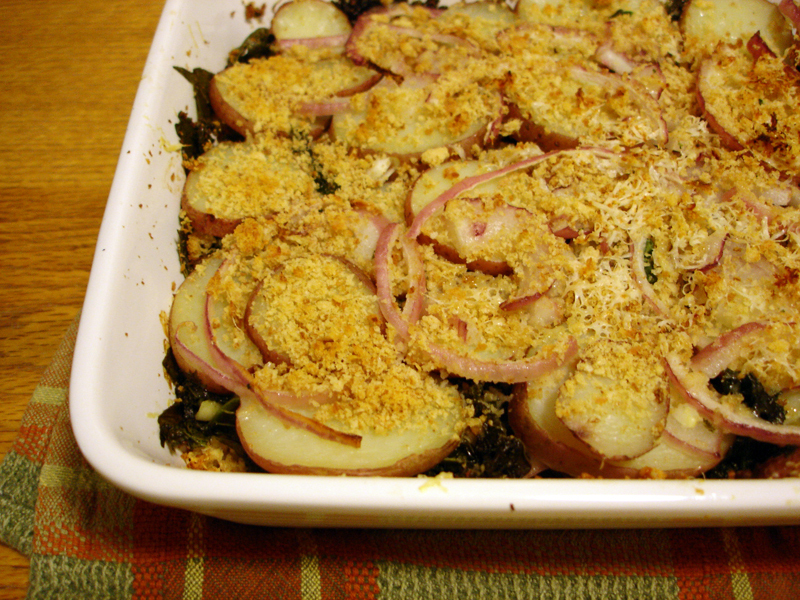 Layer the kale, potatoes, and onion alternately with a sprinkling of bread crumbs and Parmesan in a 2 quart glass or ceramic baking dish.